Oh how I miss those Fall colors. Live In Southern California now. Nothing like the East Coast change of seasons. 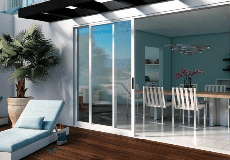 These doors will enhance any of natures beauty. The Tuscany® Series Vinyl Window collection would be a stylish upgrade to our existing 30 year old Milgard Windows. I would love to change the look of our dated home and install new windows and increase our energy efficiency. I think the Tuscany Patio Series would work well with our home. We have a very open living room and they could open up to our pool area. Style Line series is my choice because I have mountain views and contemporary decor. I want to see as much of my mountain views as possible! I could #FallinLoveWithWindows ! Low-E, argon filled with a low SHGF - perfect for energy saving and comfort!